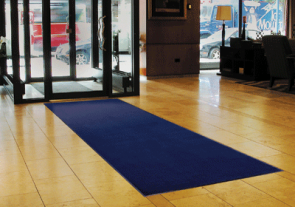 Entrance mats are essential additions to any facility. 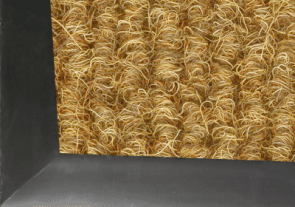 Our high quality front door mats are available in a range of materials including carpet, vinyl link, and rubber. Slip-and-fall accidents are common and cause businesses an inordinate amount of time and money. Entrance floor mats are the best way for a business to proactively avoid such accidents and liability claims. 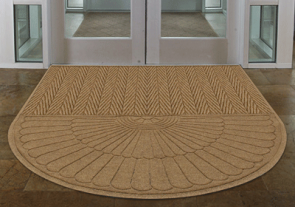 Intelligent use of outdoor mats and front door mats is the best way to increase safety. Moreover, these floor mat installations remind your guests that they are entering a clean and professional workplace that values visitor safety. 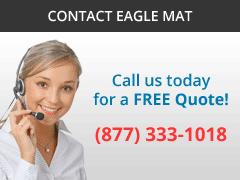 Premier Carpet Mats are the highest quality carpet floor mats in the industry today. 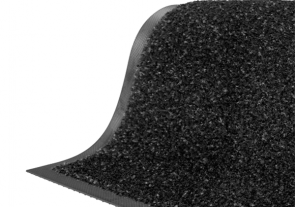 Our most popular rubber back carpet mat features a tightly woven plush carpet surface for superior comfort and functionality. Dense, most plush carpet surface. Ultra-Twist heat-set nylon yarn traps the toughest dirt and debris. Perma-Dye dying technology for long lasting color shine that won't fade. 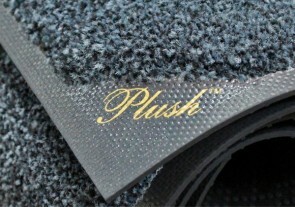 Plush Carpet Mats are the thickest and most durable high quality mats that are also Launderable. The extra thick rubber backing makes these mats heavier and longer lasting than all other carpeted rubber backed mats in the industry. Premium Solution Dyed Nylon Yarn. Great for indoor use and can handle high foot traffic areas. Soft and thick Plush surface. 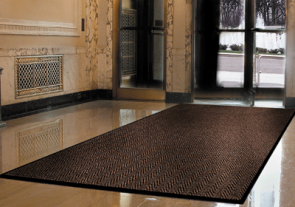 Berber Supreme Entrance Mats feature the distinct high-low Berber surface pattern. 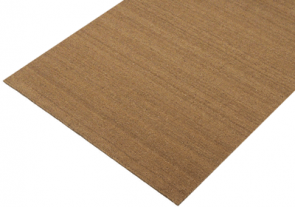 This door mat is the industry standard in protecting against dirt and moisture accumulation. Great for entrance areas, vestibules, and elevators! Ideal for heavy traffic both inside and out. Unmatched aggressive dirt, debris, and moisture protection. Distinct surface pattern is popular in hotels and Class A buildings. Mat features commercial grade Nitrile rubber backing for superior durability and longevity. Berber Supreme Brush Mats offer the same style and uniqueness of our Cocoa Mats. This mat is a Berber-made alternative to the Cocoa door mat. 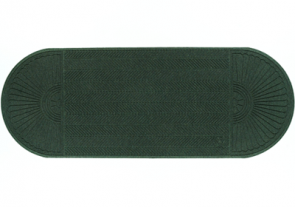 Berber Deco Rib Mats are one of our most entrance floor mats. 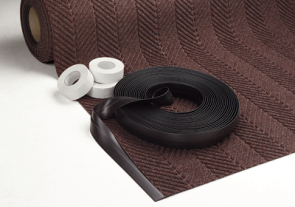 Deco Rib represents one of the most effective options for trapping dirt and moisture at the door. 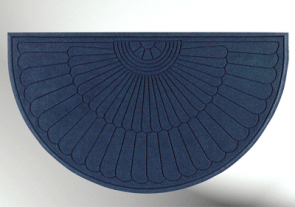 Door mat features distinct Berber high-low nub design. Aggressive high-low ridge surface design allows dirt and moisture to fall below the surface of the mat. Micro Guard matting is treated with AEGIS Microbe Shield technology to guard against degradation from microorganisms, reducing odor emissions in entryways and other high traffic areas. Antimicrobial system is permanently bonded to each carpet fiber, providing longevity and effective lifetime control of odors. Special Microbe Shield technology eliminates the toughest odors. 100% Nitrile rubber backing for superior traction control. Clean by vacuuming or ask about our commercial laundering service! Comes in 3 vibrant colors: Blue Marble, Grey Marble, and Maroon Marble. 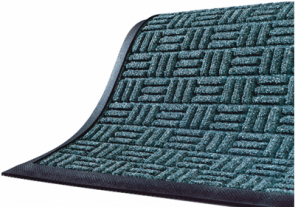 Classic Brush Floor Mats have stiff monofilament tufts that are woven into the surface of the carpet mat. These “tufts” provide added scraping action and cleaning ability. Monofilament tufts add aggressive shoe scraping action. 100% Nitrile Rubber backing for superior skid and slip resistance. 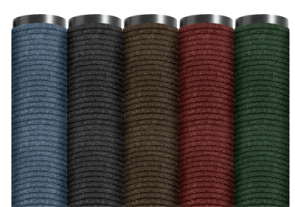 Coarse nylon fiber added to the yarn is great for maximum cleaning and traction control. 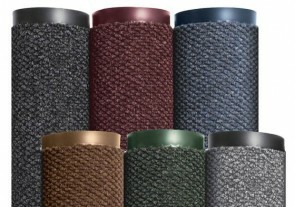 TNT carpet mats feature a plush Olefin yarn construction that makes for a soft cushioned walking surface! A high quality mat at an economical price. Mildew and stain resistant, these carpet mats are easy to clean. Ideal for moderate traffic for indoor applications or partially exposed outdoor areas. Chevron Entrance Mats feature a solid chevron design for excellent scraping action for moderate traffic in all directions. Vinyl back stabilizers keep the mat firmly in place. Ideal for moderate traffic indoors or under covered outdoor applications. Chevron ridges effectively scrape dirt and debris from all directions. Rows of chevron ribs trap dirt underneath the walking surface of the mat. 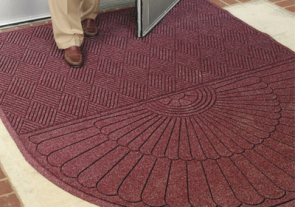 Ribbed Entrance Floor Mats are constructed are designed to trap dirt and moisture below the walking surface of the mat, leaving your front door mat looking clean, leaving contaminants at the door. Our most popular vinyl-backed mat! For use indoors or in partially exposed outdoor areas. 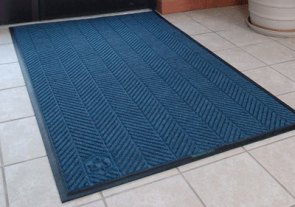 Ribbed entrance floor mat cleans aggressively and effectively. 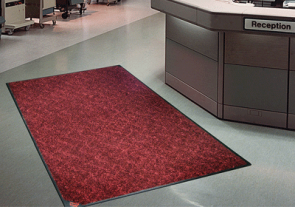 Diamond Design Entrance Mats feature a slightly raised high-low diamond nub design. 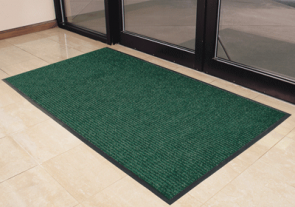 The tightly woven polypropylene yarn and stable vinyl backing make this and ideal aesthetically pleasing entrance mat while providing tough scraping functionality in moderate trafficked areas. 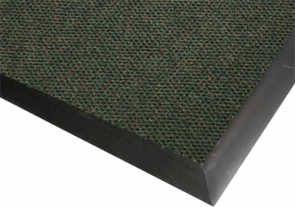 Excellent matting product on an economical budget. Sturdy vinyl backing and border secure the mat firmly in place. 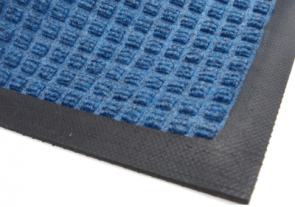 Our Rubber Scraper Mat features a 100% Nitrile rubber construction that is made to last! Raised rubber cleats effectively clean foot traffic while trapping debris below the mat's surface. 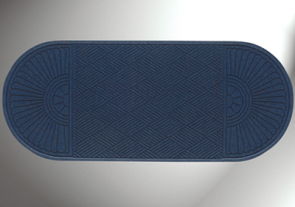 Rubber Scraper Mats are available in three different patterns, including our Oblong, Circular, and Multi-Directional patterns! 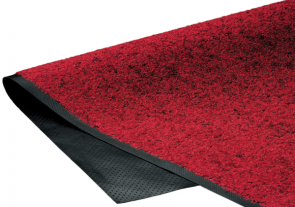 Rubber Pronged entrance mats feature thousands of dense co-polymer rubber scraping fingers that effectively removed pounds of dirt from sight and hold it underneath the walking surface. Available in a wide variety of sizes to fit virtually any outdoor entrance! 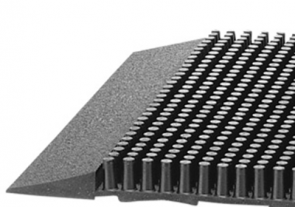 Rubber Drainage Mats feature a resilient multi-directional surface that effectively cleans away dirt and grime. Surface is elevated and features large holes for easy drainage! Made of 100% heavy-duty Nitrile rubber. 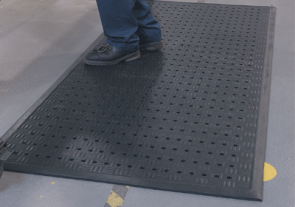 Anti-slip skid resistance for added safety. 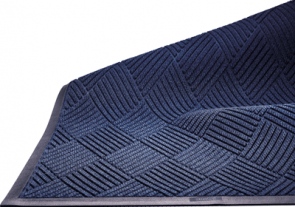 Soft Floor Drainage Mats are heavy-duty construction rubber drainage comfort mats that feel great even on bare feet. 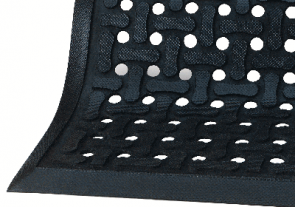 Perforated holes provide excellent drainage below the mat and away from the walking surface. Grease proof and anti-microbial treated. Soft Floor comes 7/16" thick for superior comfort. One of our softest feeling all rubber construction anti-fatigue mats. 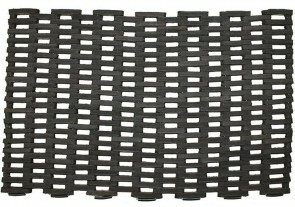 Tire Link Door Mats are manufactured using recycled rubber and galvanized steel rods for reinforcement. 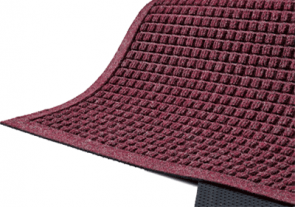 These eco-friendly floor mats are heavy-duty and virtually indestructible. Designed to hold the same weight for transporting horses and cattle on the floors of caravans, this Tire Link mats are built to last. 100% recycled rubber and 12-gauge galvanized steel construction. Designed to scrape away the toughest of dirt and debris, leaving remnants below the surface of the mat. Vinyl Link door mats are manufactured using rectangular links that are bound together with industrial strength stainless steel rods. The stainless steel construction and vinyl links provide for superior long-lasting durability while offering a slightly different look for your entrance or door way.